A story about Augustine Herrera and the Herrera Family racing heritage. 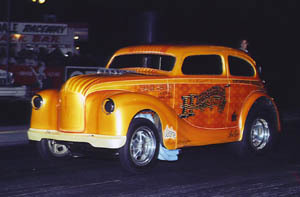 Back in the early days of my drag racing career, or at least my drag racing enthusiasm, the only way that I could get any information about what was going on in the sport was to read National Dragster or some of the other publications that covered drag racing. As an east coast guy, I always looked forward to getting those newspapers or magazines so I could check the race results. I also wanted to find out about who the hot drivers were out west and I wanted to learn about the cars that I would never see at Atco Dragway, but cars that I really admired. I remember, specifically, reading about Hugh Tucker's spectacular roadster, still one of my favorites, and a car you can see next year at the 50th anniversary Winternationals. One of the other cars that always caught my attention was the beautiful gold 1950 Austin that was campaigned under the banner of "Herrera & Sons." I have to admit that I never saw the car run, but at the recent Auto Club Finals in Pomona I did get to see one of the "sons" race. Or should I say one of the grandsons? 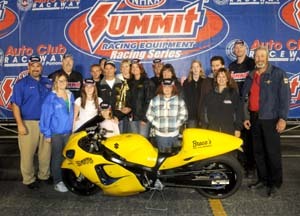 Augustine Herrera won the Summit Racing Series national championship in the motorcycle class and he is the grandson of John Herrera, the patriarch of that great team. In the 1960's John Herrera and his sons, Manuel, Richard and Phil campaigned a lot of cars, ranging from a 1949 Pontiac to a 1955 Chevrolet, a 1941 Willys, an Anglia and the famous Austin. 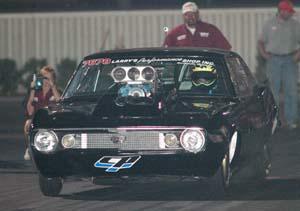 "My dad was part of that team," Augustine said, "so it might have been fate that I would end up drag racing." His dad, Phil, actually got Augustine started in racing, but not in a car and not on asphalt. "He got me a dirt bike when I was about three years old and I raced that for a while." I guess he must have lost the keys to the Austin. Anyway, two wheels were in his blood at an early age and that continues today, although that's not the only thing that Augustine races. "I actually raced our family's A/G Camaro in the Hot Rod Heritage Series this year and I've raced it in some Top Sportsman races, too." 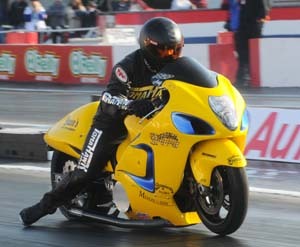 He also competed in Super Gas at the 2009 Winternationals, and he says that some of the racing at Pomona may actually have helped him win the Summit Motorcycle championship this year. "I may have had a little home-court advantage over some of the other guys since I wasn't awed by racing at Pomona. My family has raced there and so have I, so I may have been a little more relaxed than some of the guys I raced." I don't know if I he was relaxed but he certainly was good. In round one he dialed an 8.53 and ran 8.55 against the Division 1 champ, Jason Longley. In the next round he was even better, running a perfect 8.520 on his 8.52 dial and that came against William Keele from Division 4. 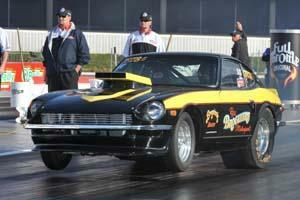 In the final round he dialed 8.49 and ran 8.498 to get the win over Bruce Damewood from D-5. It should also be pointed out that he did all of that on a motorcycle that doesn't have a wheelie bar. For a family that made a name for itself running a 1950 Austin it shouldn't be a real surprise that their latest member would make a name for himself with a vehicle that's just a little different. "It's just something I always wanted to do, "Augustine said. "I love the challenge. To me, part of the fun of racing is riding the bike, and to me, riding with a wheelie bar takes some of the excitement out of it." Many drag racers have tried to do things their way over the years and most of them have eventually come back to the more conventional, tried-and-true methods that their competitors use. But not Augustine. "I have ridden a bike with a bar but it was a Funny Bike and they get right up on the wheelie bar and carry the front wheel until about half-track, and that's a fun ride. But for my regular bike, this is more of a challenge and a lot more fun." 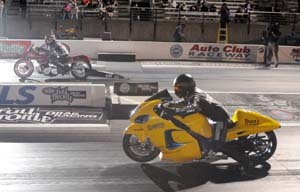 His bike, a 2005 Hyabusa, didn't begin life as a drag bike, in fact, it didn't start out as a race bike at all. "It was a show bike for Susan Robinson who races at Bonneville. I got it and converted it to a drag bike." In addition to not having the normal wheelie bar, there is something else that's a little different about Augustine's bike. "It doesn't have a clutch lever. It's a slider clutch, and not many guys use it. It's sort of like a torque converter that's on it and it helps keep it pretty consistent." Consistency is important in any racing vehicle, especially one that weights about four hundred and fifty pounds (without the rider) and has two hundred and fifteen horsepower. "It's got a blue-printed engine, bigger pistons and it just runs really well," he said. And since it's running so well and winning national championships Augustine figures it has to help his new venture. "I began building race engines for myself and that grew into a business where I now dyno-tune engines for other bike guys. It's going pretty well right now and I hope to be able to keep doing it for a while." That is if he has time between his regular job, which is working in the family's refrigeration business, running races in a couple of cars and a few different classes and defending his national championship. "The fact that I won really hasn't set in yet," he said. "I guess it will in a while." Augustine may have had a little home-court advantage by running at Pomona, but he had a little disadvantage by being a Division 7 racer. "We don't run electronics out here," he said. "So when we went to the Summit finals I had to put a delay box on the bike and that's something that I never raced with before." Enter Mitch Lippen, a fellow racer and crew chief in the D-7 motorcycle class. "He came over to me at the division finals in Phoenix, handed me a box and said, 'Here, use this, you're the best guy in the class.' I put it on the bike right before Pomona and used my time runs to get used to it. I want to thank Mitch for the help." It apparently didn't take him long to get acclimated to the new gadget since he ran so well in eliminations and he punctuated his day with a solid .013 reaction time in the final round. "The bike had been getting quicker during the day, I eased up and ran that '52' in the second round and had a good run in the final. It was a nice day." So a guy who grew up in a racing family, who doesn't use a wheelie bar and who had to put a delay box on for the biggest race of his life, is now the national champion. "I love racing, I love the competition and that's why I enjoy driving the cars as well as the bike." And just think, it all started with his grandfather and was carried on by his father and his uncles. Still, as much as they accomplished in their careers, none of them ever won the national championship. I can just picture some kid getting his latest National Dragster this week and saying, "I hope someday I get to see that Augustine Herrera race." Hey, that's how this whole drag racing thing started for me! Herrera and crew celebrate win. Following his win Augustine said that he would like to thank his wife Kim, "for always being there through it all. I would also like to thank my daughter, Miranda, and my son, Gaige who is also my crew chief because I couldn't have done it without him. I'd also like to my mom and dad. Thanks, too, to Ray Broguiere, the owner of Broguiere's Dairy, Medlin & Sons Fabrication, Tim from Ultimate Design, Mickey Thompson Tires, PR Factory Store, Diamond Bar Choppers and all my friends on and off the track who make racing fun and competitive. Also, a special thanks to Summit Racing for giving the sportsman racers a chance to race at a major event like the Auto Club Finals in Pomona. Thank you."